"With this faith, we will be able to hew out of the mountain of despair a stone of hope." 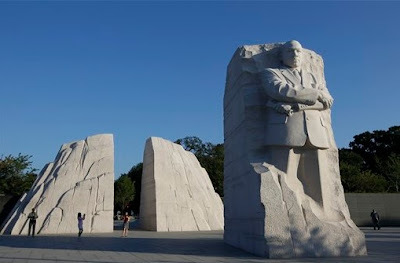 I'm very happy about the new National Memorial to honor Dr. Martin Luther King, Jr.
And while the hurricane back East may have delayed the official dedication that was to have taken place yesterday, I don't want to delay sharing this with you. It is one of Dr. King's most famous speeches, and every time I hear it, I get goosebumps. I listen to it often, and while I've read the words on the page and on the screen, the impact of hearing and watching Dr. King delivering his speech is so powerful. Thanks for this, Lee. This memorial is a tremendous leap to making Dr. King's message an integral part of the future fabric of our country and our planet. And let's also mention here a related inspired soul - Bayard Rustin, Martin Luther King, Jr.'s colleague and the organizer of the 1963 March on Washington who was openly gay and started his activism back in 1937!! Thanks for your comment, Avi, and YES, so glad you mentioned Bayard Rustin - an openly gay hero of the Civil Rights movement!